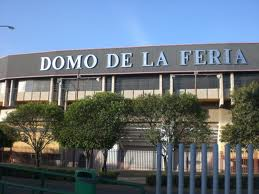 Domo de la Feria is the name of a building in Leon, Guanajuato. Lucha libre shows are usually held here on Mondays. They include both CMLL and AAA shows, including television tapings for the latter. The capacity of the building is 5,240. The address of the building is Boulevard Adolfo López Mateos Oriente 1820, Colona La Martinica, CP 37550, León de Los Aldama, Guanajuato, México. The phone number is +55 47 7771 1717.